Rock And Roll IS Dead! EDDIE AND THE CRUISERS II: EDDIE LIVES! finds the “legendary” (snigger) singer-songwriter of Eddie & The Cruisers, morose Eddie Wilson (Michael Pare), “in disguise” as morose Joe West, assembling another band of hokey bandguy stereotypes and thrilling us with another cache of songs which you might mistake for Macy’s muzak reel, or Frank Stallone’s songs in STAYIN’ ALIVE. Telltale signs that this is an eighties movie: the keyboardist is a dork with a DX-7; people clap in time with the music; unnecessary levels of reverb on the lead vocal; Average White Boy drum fills; rock guys wear tourniquet jeans and studded belts; the band sounds exactly like Bruce Springsteen, except they’re, uh, not good.Eddie Wilson’s recorded works are enjoying a renaissance in the boring-music-buying community. How his music ever got commercially promulgated is a mystery in itself (which is never explained), and there is absolutely no marketing incentive to the plot fabrication of a major label offering a quarter-mil to anyone providing info on who the session players are on these alleged Eddie tapes. Suspension of disbelief is an understatement. To fully enjoy this movie, one requires a full frontal lobotomy, no exposure to the last fifty years of rock and roll and a golf club delivered at strategic intervals to the scrotum. A resurgence of media interest in the Eddie & The Cruisers entity would mean, technically, that everyone in the nation with a tv or radio would be exposed to Eddie Wilson – yet no one can recognize this mourning-faced Jersey dropout with the overdeveloped triceps – that is, not until he shaves his mustache off! Yes, that’s right – Eddie graduated from the same School Of Disguise as Clark Kent: a mustache was all it took for no one to recognize him as the LEGEND that they’re all enamored with. 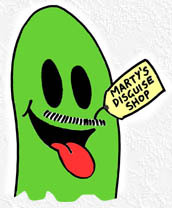 (It wasn’t just the mustache – it was the way he was wearing it.) I guess he also disguised his voice, from that of dopey Jersey dropout to that of dopey Jersey dropout. Pure Genius! So Eddie and his retarded guitarist start recruiting other – oh, you say the guitarist wasn’t retarded? I’ll take your word – start recruiting other musicians who couldn’t care less about actually investigating this band that he is asking them to join. Apparently, the correct answer to: “What type of music do you play?” is, “The right type.” One street-cred handshake later and these nonces are being told off in Eddie’s basement for playing like wooftas. Now here is ample proof that the film-makers have never seen a live band, never been around musicians, never been in charge of producing recorded music in their uneducated lives: If you make Eddie criticize the drummer for “racing,” then by Liberty DeVito – make the drummer race! What kind of monkey director would insert a soundtrack as tight as this and then have the MD accuse the drummer of getting ahead of the band? Eddie is constantly accusing the band of things they haven’t got the imagination, talent or acting chops not to do, such as, “Let’s get back in the pocket!” – “in the pocket” being a musician’s slang term that is inexplicable – either you viscerally apprehend what “being in the pocket” is, or you don’t – and it’s clear the film-makers don’t, for this soundtrack sounded as tight as the proverbial nun’s part-that-is-tight, meaning – it was already “in the pocket” before Eddie even accused them of not being there. Not that their pocket was all that groove-oriented – we’re talking the Average White Boy’s pocket, which is about as far away from a real musician’s pocket as Jersey is from Tokyo. But Eddie ain’t talkin’ Real Musician’s pocket – we find he’s only talkin’ White Boy Pocket anyway, for when they eventually enter the arena, they’re playing exactly the same as they did when he was befouling their names. And apparently, this is good enough to elicit smiles and bandguy camaraderie from Eddie. Ultimately, there was no need to make varying soundtrack mixes (“racing,” or basement-sounding, or – heaven help us – in an actual pocket) because this movie’s demographic was, in fact, Average White Boys and their bangled dates with bouffed hair and furious-pink vinyl skirts with the oversized belts that don’t go through any loops. 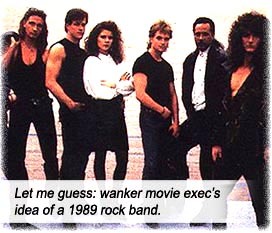 And how dare Eddie demean his bandmates so openly? How much is he paying them to eat his derision? The way the movie plays out, it’s implied these donks are doing it “for fun.” Money is never, ever mentioned. And Eddie/Joe is always shying away from any schemes which GuitaRetard keeps cooking up, to try to garner income – he even punches out The Record Label Guy at the end. He’s pathologically horrified of success! A musician who keeps insisting that “the band isn’t ready” is only trying to find excuses not to create forward momentum. I’ve actually done paid sessions with band leaders like Eddie, who turn down paying gigs, keep re-arranging songs, never record because they’re never satisfied with the arrangements – and it’s not because they’re musical geniuses, it’s because they’re neurotic! Eddie is paying – or not paying – these dorks to simply assuage his insecure ego. The film-makers never give us any indication of what makes Eddie “good,” for he’s a mundane rhythm guitarist (although the saxophonist describes him like he was Mark Knopfler: “Nobody can disguise the way they play. I recognized your Playing, man!”); he’s an average shouter/singer (doing great blowfish impressions when he should be lip-synching); his songs: Springsteen Lite with lyrics as enthralling as striping a master tape with time code; his personality: neurotic, misogynistic, narcissistic, self-delusional – tell me again why we should empathize with this nut? Even if you take away all the technical musical deficiencies, Eddie is still just a gym geek with no friends. Are the film-makers implying that that banal elevator muzak soundtrack is so good that people will go to these idiotic lengths to pander to this guy? Now where’d I put my furious-pink vinyl skirt? Writers: P.F. Kluge, Charles Zev Cohen, Rick Doehring. Starring: Michael Pare, Marina Orsini, Bernie Colson, Matthew Laurance, Michael Rhoades, Anthony Sherwood, Mark Holmes, David Matheson, Paul Markle, Kate Lynch.